We are not currently doing any Restoration, Body or painting work. 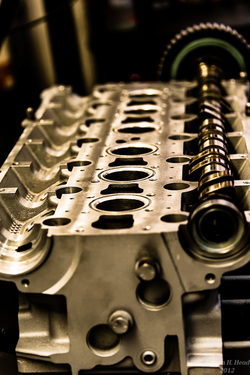 We will be more then happy to help with any of your Machining, Casting Repair, Engine Rebuilding, Cylinder head repair and fabrications. If you are looking for Restoration work we will gladly point you in the right direction. Check out our hardest and most time consuming casting repair to date! Due to the fact that we repair all types of metals we have had some very unusual projects come into our shop over the years. 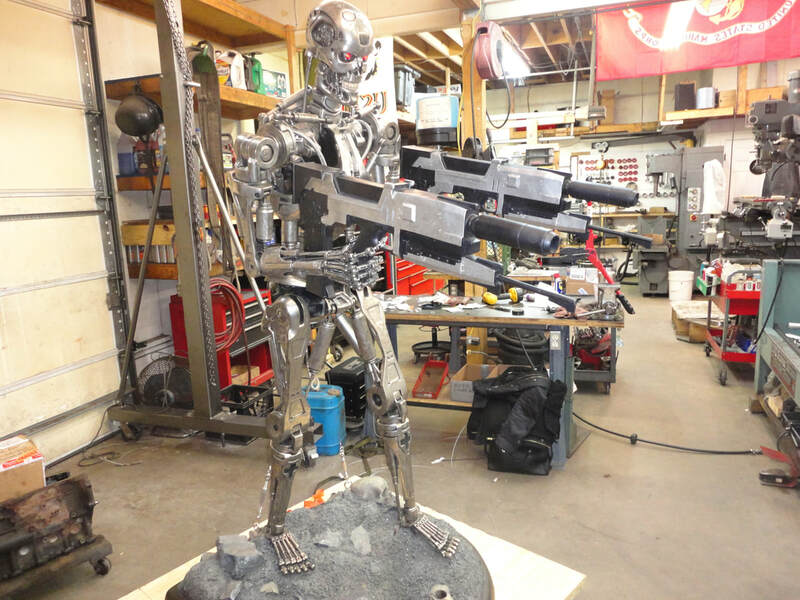 Here is a bigger then life statue of the Terminator. As you can see by the before picture he has begun to lean and could not even hold up his guns. We designed a platform, cable and turnbuckle system to straighten him up and allow for his guns to be brought up. He is now ready for display. Be sure to go to our online store and check out our products to help you with your thread repair and Broken bolt needs, among other items! Welcome to The Restoration Shop. The most complete automotive restoration, machining and fabrication facility in the Washington DC area family owned and operated in historic Stafford Virginia. We opened our doors 40+ years ago to establish a reputable and reliable restoration facility. Accomplishing that goal took us down many roads over the past 40+ years, our goal was to do all work in house to assure quality outcomes with a one source responsibility and that dream is now a reality. Now, forty plus years later, we can bore a single cylinder off of a tiny dirt bike, or a seven inch bore in a John Deere tractor. We can grind a small 4cyl crank or a 60" Cat crank, rebuild a single cylinder engine to big diesels and everything in between. We have expanded from restorations, to a complete facility that can repair, fabricate or refinish anything that has to do with metal. We repair cracked castings, weld steel, aluminum, cast iron and any other kind of metal. As you explore our web site, you'll see many different projects from conventional restorations to specialty projects, standard rebuilds to high performance motors. If you have a specialty project in metal or need a broken fastener removed, you've come to the right place. A one source responsibility. We welcome you to take a virtual tour of our website and our shop so you can see for yourself. For any further information, or for a free video, just fill out the contact us box and we will send one out or give us a call @ 540-659-3797. We look forward to helping with your project..